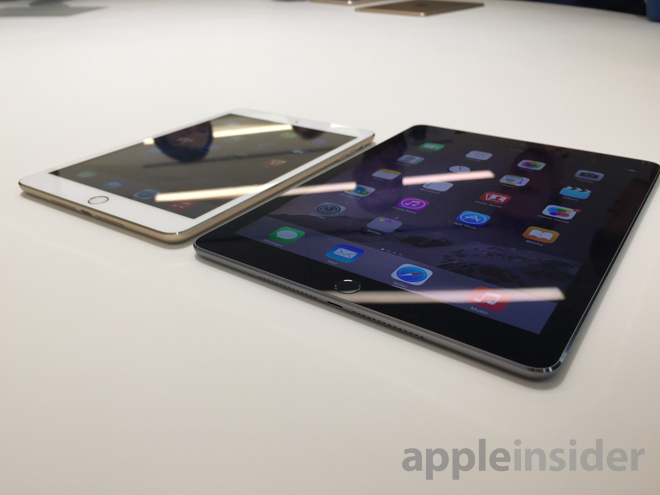 The iPad Air and iPad mini have both been outfitted by Apple with Touch ID fingerprint sensors, but it's clear that Apple is positioning its flagship iPad Air 2 as the tablet to beat, boasting a beefed-up A8X CPU, improved camera, thinner design, and anti-reflective laminated display. 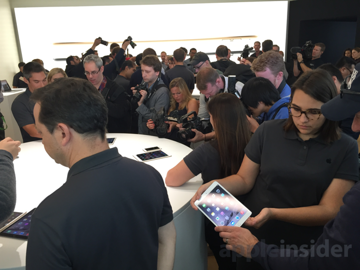 Both the new iPad Air 2 and iPad mini 3 with Touch ID were unveiled at a presentation at Apple's corporate campus in Cupertino, Calif., on Thursday, and AppleInsider was there to go hands-on with the newly announced tablets. 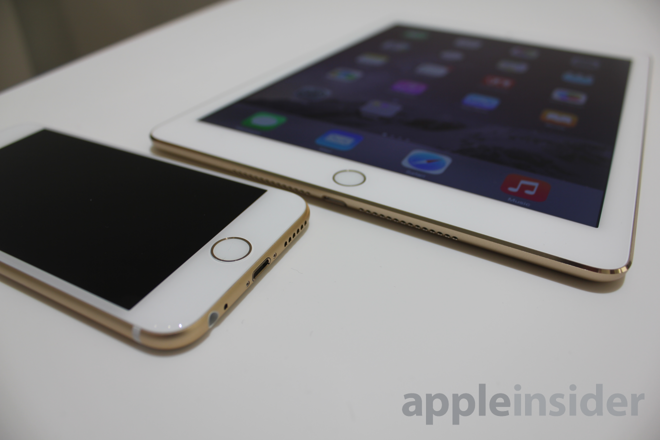 In our brief time with the iPad Air 2, we found it to be super thin, but it feels right in your hands. 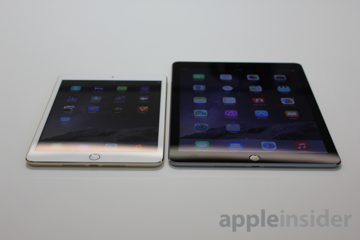 Amazingly, it's even thinner than the iPhone 6, measuring just 6.1 millimeters thin. 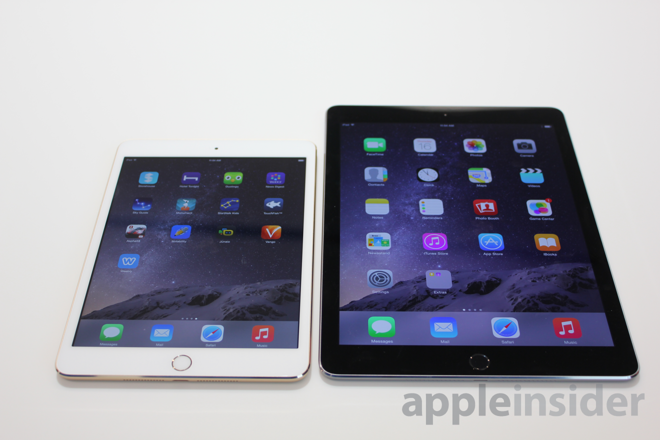 The iPad mini 3, meanwhile, features the same design as its predecessor, and also includes the same A7 CPU. Aside from Touch ID and a new gold color option, it's unchanged from the 2013 model still available for $100 less than its $399 entry price. With the decision to limit changes to the iPad mini 3, it's clear that Apple wants users to buy the larger $499 iPad Air 2, which offers more value in the A8X CPU, improved cameras, and a new display that reduces glare by 56 percent over the first iPad Air. Another upsell comes in the form of capacity: While the entry-level models feature 16 gigabytes of storage, a $100 premium nets four times that: 64 gigabytes, just like with the iPhone 6 and iPhone 6 Plus. 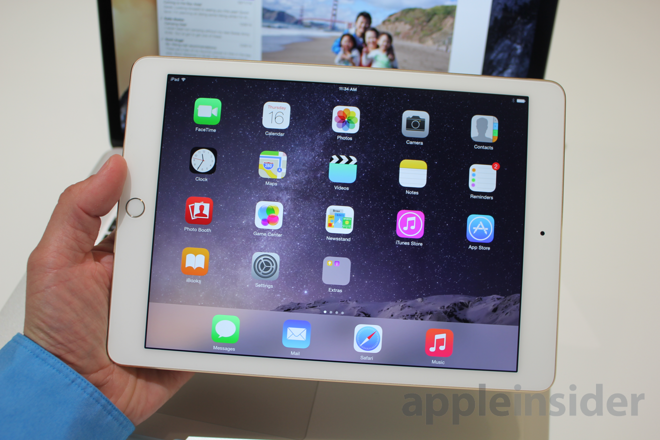 $399 iPad mini 3 features same A7 processor as $299 iPad mini 2. $100 premium gets you Touch ID and nothing else. Worthwhile upsell? 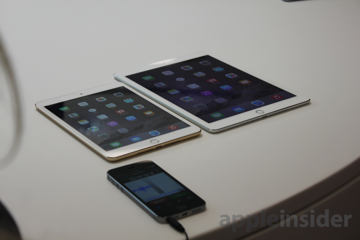 The display on the iPad Air 2 is also laminated to the glass cover, a feature previously only found on the company's iPhone models. This completely eliminates the gap between the LCD panel and the glass cover. Touch ID on the new iPads works as it does on the iPhone, allowing a user to securely unlock their tablet with just their fingerprint. The Touch ID home button will also work with iTunes purchases, the App Store, and third-party apps that take advantage of the feature. Apple has also announced that the iPad Air 2 and iPad mini 3 will support Touch ID use for Apple Pay when authorizing online purchases. After correctly identifying a user by their fingerprint, the iPad will automatically input payment information for online purchases. From our hands-on, we discovered that Touch ID does still require a lock screen passcode to be enabled for all functions to operate, including authorizing iTunes purchases and Apple Pay. This means that users will not be able to use the Smart Cover auto-unlock feature, which bypasses the lock screen without pressing the home button, while simultaneously utilizing Touch ID functions.